This graceful three and a half story Victorian home was built by Samuel L. Smith at a cost of $5,500. The builders were Lynn and Lewis. T.R. Griffith modified the plans to make the exterior more striking. Mr. Smith and his wife, Harriet, lived in the house until his death in 1895. She then moved across the street and lived there for many years. In 1896 Cassius Hall and his wife Fannie purchased the home. He came from Massachusetts and was in the grocery business. 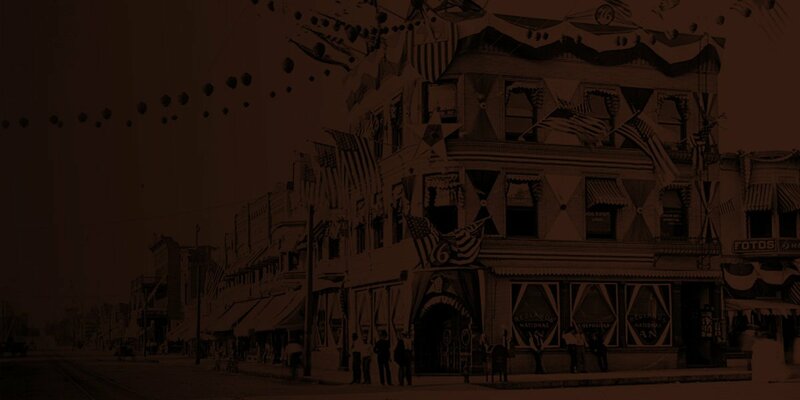 He opened a store in Redlands in 1896. His free time was occupied taking care of his orange grove. At this time the property consisted of about ten lots.One of the most striking features of this home are the cross pediments. They have high gable roofs and the ornamentation is composed of pieces of wood, bottle glass, tile, shells and sand. The front facing pediment has wood vents at the top with two double hung windows below. An open sleeping porch or balcony is under this pediment and is supported by turned posts. The balustrade is spool with wood shingles below.The Halls sold the property in about 1901. Over the years it had many owners and renters, and also stood vacant. Mrs. Julia T. Hart purchased the home in 1936. The Redlands Directories lists her occupation as proprietor of the Lico Rest Home which had the same address on Cedar. The directories list her occupation as rest home operator until 1965 when she retired.Under the open sleeping porch is a polygonal bay window. To the west of this bay is a small balcony. The door leading out to the balcony has triangle stain glass at the top. The open veranda of this home extends across the front and part way on either side of the building. Fourteen turned posts support the veranda which has a stick balustrade. Three doors face north and open onto the porch. All have stain glass at the top with inset wood panels below. The off center front door has a plain glass transom at the top. On either side of this door are different size windows with stained glass. The east side of the building has two pediments, one ornate and the other plain. A bay window is on the west side of the home and has inset wood panel decoration below. Dr. Eurique Arevalos did much of the remodeling of the home in the early 1990’s. He restored the veranda by removing the enclosure on the west side, placed over head wiring below ground, new septic tank, furnace etc. The present owners David and Heather Maguire and their daughter Amy purchased the home in 1998. The Maguires are from Great Britain and this home reminded them of houses back home. Especially the small rooms that could be shut off from the rest of the house. They have enjoyed taking care of the yard and garden. 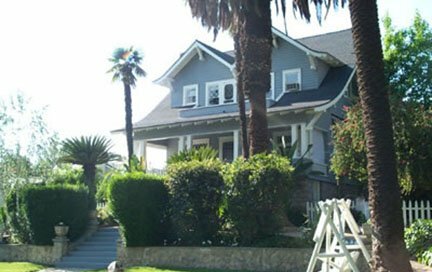 The Redlands Area Historical Society is pleased to present this Heritage Award to the Maguires for their love of this home.